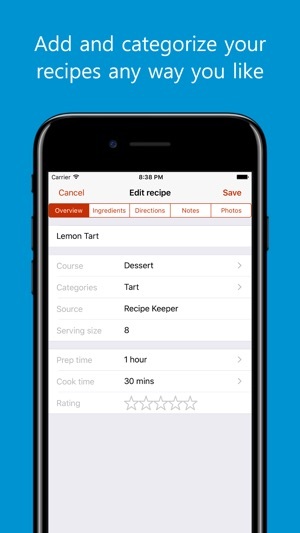 Quickly and easily enter all your favorite recipes and organize them exactly the way you want. Create the ultimate personal cookbook with recipes from your own cookbooks, magazines and recipe websites. Recipes can be entered with as little or as much information as needed and can be grouped by courses and categories that you define making Recipe Keeper work the way you do. Import recipes automatically from many popular recipe websites then tailor the recipes for your own needs. Add ingredients to your shopping list straight from a recipe with one click. View your shopping list on your phone while in the store. Plan your meals for the week with the built in meal planner then add your meals straight to your shopping list. Share your recipes, shopping lists and meal planner across all of your iPhones, iPads, Macs, PCs and other mobile and tablet devices (separate purchase required for other platforms). 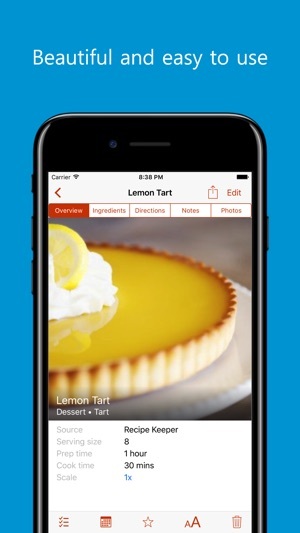 Attach photos to your recipes, add your own notes, rate your recipes and flag your favorites. Quickly search for your recipes by ingredients, directions or rating. Share your recipes on Facebook, Twitter and other social networks and by email. Print your recipes, shopping lists and meal planner. 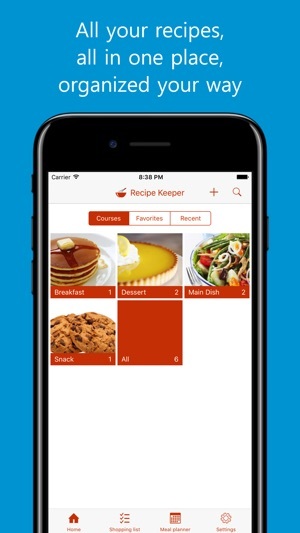 With Recipe Keeper you finally have one place to keep all of your recipes organized just the way you want! Recipes can now be linked together. Ingredients can now be checked off while cooking. The current direction can now be highlighted while cooking. Recipe scaling can now be set permanently. Amazing! Three apps in one!!! I buy so many ingredients for recipes I KNOW I needed something for at some point, but never remember every ingredient so I don’t end up making it, or I may not find the recipe again. It’s too confusing to keep up with so many apps, and this has saved my life! I had a few questions on function (I sometimes don’t read FAQ’s well...my bad...) and I sent customer support an email. They got back to me within 24 hours! Then I responded and it was less than three. Very, very helpful. I don’t mind at all paying $5 for the upgrade or even $10 if I put it on both iOS and droid. I think it’s a steal! Can’t wait to see what new features they may add based on suggestions or their own experiences! The best recipe app I have! I have used this app for 2 or 3 years and it is far and away the best app I have. I have another app which has a ridiculously expensive monthly fee, is clumsy, and doesn’t operate nearly as well as this, nor has a scaling feature. It does however import Pinterest recipes, which is useful, captures both scanned and handwritten recipes, and frankly are the only reasons why I am keeping it currently. If you are in anyway undecided about which recipe app to keep on your device, I highly recommend this one. Personally, I think it really is worth paying the very small fee for being able to use this app limitlessly and across all your devices. I cannot think of an occasion when it was buggy, or I couldn’t access it, and that is quite singularly rare in a world where developers are generally putting their products out before conclusive testing. Frankly, I cannot think of a reason to deduct even one star from my rating. My only wish from the developers of this app is to be able to import recipes from sources such as Pinterest, and to scan in handwritten and screenshot recipes, then I could delete my other ridiculously expensive and clumsy app, that I really don’t like. I love this app! For years I’ve wanted a spreadsheet to organize my recipes to make an easy shopping list. Lately I’ve been wanting to be able to search recipes by ingredient so I can use up perishable items that are on the verge of perishing. I tried a few apps and found this one to be the absolute best! I’ve been extremely thrilled with it! I can edit the categories to suit my particular organization, construct multiple shopping lists, format recipes to suit my visual preference, import straight from the internet, search by multiple ingredients, and add my own photos or one from the internet. It works offline as well so recipes I’ve uploaded are readily available even when I don’t have internet access. Bonus features I wasn’t even expecting are weekly food plans and the ability to select the scale of a recipe. The app will halve, double or adjust every ingredient in the recipe by any multiplier. I recommend paying the price to sync between devices. 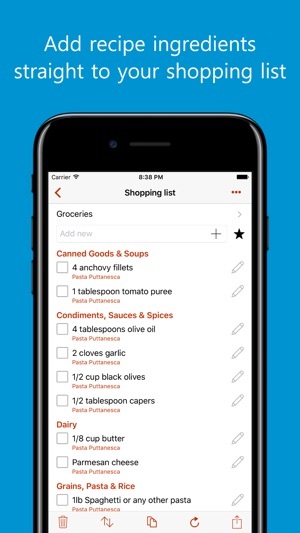 That way your shopping list is on your phone while your recipes are easily displayed on your iPad. 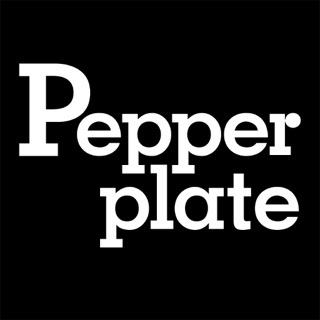 If you like to cook, need organization when shopping, and appreciate nicely displayed recipes, get this app!! !